On Sunday 23 June 2013, the moon came at its closest point to earth just about 356,989 kilometers away. Because of it the moon looked around 8 percent larger than it original size and, approximately 17 percent more brighter than usual. 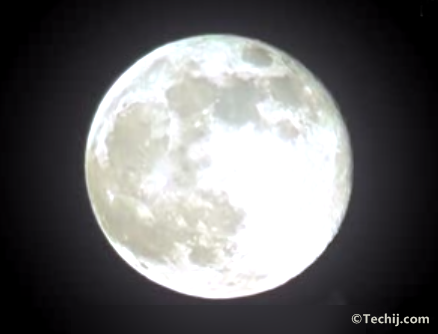 That cause the moon or "super moon" look 8% bigger and 17% brighter than normal. The best view of this wonder was seen at dawn (early morning) in all Americas while in Asia it is viewed at sunset time. Usually the distance between moon and earth is approximately 384,400 km but, yesterday the moon came nearest to earth at 7:00 am in US and at 10:00 am in Pakistan. The super moon occurs only once a year. So, if you missed yesterday wonder than wait about 15 months to view the next super moon of 2014. Interestingly the super moon phenomenon have been supposed responsible for many effects on earth and humans. But yet, none of the effect is being proved scientifically except of high sea waves.